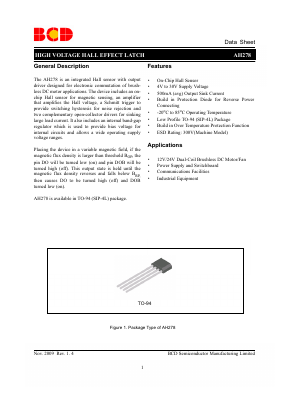 AH278 Datasheet PDF - Diodes Incorporated. The AH278 is an integrated Hall sensor with output driver designed for electronic commutation of brushless DC motor applications. The device includes an on-chip Hall sensor for magnetic sensing, an amplifier that amplifies the Hall voltage, a Schmitt trigger to provide switching hysteresis for noise rejection and two complementary open-collector drivers for sinking large load current. It also includes an internal band-gap regulator which is used to provide bias voltage for internal circuits and allows a wide operating supply voltage ranges.